One of the questions that we frequently get from customers is, “We’re having trouble out in the shop working with your expanded metal mesh. Is there anything I can do to make it easier for my manufacturing people?” Fortunately, the answer is, “Yes, there is.” But let’s first talk about what the problem might be and then what you do to make things go smoother. During the expanding process, die teeth pierce the incoming metal foil from above creating the distinctive diamond shape pattern. Depending on the geometric configuration specified by the customer, the foil may also be put under longitudinal tension. Both of these processes result in residual stress in the mesh, commonly known as “work hardening”. As anyone familiar with metals manufacturing knows, work hardened material is stiffer, springier and more brittle than stress free metal. The good news is that work hardening effects can largely be eliminated through the thermal process of annealing. However, some amount of residual stress can be helpful. It is usually easier to handle thin meshes without wrinkling or losing grid geometry if some stress is left in the metal. More to the point, the amount of residual stress can usually be optimized for the customer’s particular application by controlling the time & temperature cycle of the annealing process. Dexmet engineers are experts at annealing most metals and can help you choose the right specification for your application. Another result of the expanding process is that the thickness of finished material is increased by up 800% as a result of the twisting of the strands. This increase in the z-dimension is quite beneficial in some applications (e.g. ; pressing battery electrode powder onto mesh current collectors), but not always. The z-dimension is also not uniform across the width of the mesh role. Dexmet can control this parameter to tight specifications by passing the expanded mesh through dimensioning rollers in a post processing step. The mesh can be “flattened” back to the original incoming foil thickness or lightly rolled to ensure consistent edge to edge thickness. Also, it is important to note that expanded mesh is anisotropic. That is, its properties are different in different directions. Most engineers recognize the difference in latitudinal (stronger) and longitudinal (weaker) strength. But other properties, such as electrical resistance, also vary and control of these should be discussed with a Dexmet engineer. In roll-to-roll processes, it is important to remember that mechanical behavior is dependent on the directionality of reel. 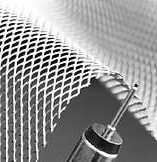 Dexmet can re-roll mesh on new cores to ensure uniform behavior in the customer’s process. The more upfront information that is shared with Dexmet engineers during the early product development stage, the more likely your future processing issues will be significantly reduced or eliminated.